Zoroaster (Greek Ζωροάστρης, Zōroastrēs) or Zarathushtra (Avestan: Zaraθuštra), also referred to as Zartosht (Persian: زرتشت), was an ancient Iranian prophet and the founder of Zoroastrianism, a religion that was the national religion of the Sassanid Empire of Persia; it is predominantly practiced today by the Parsi community of India. Zoroaster is generally accepted as an authentic historical figure, but the period in which he lived remains unclear. Many scholarly estimates place him circa 1200 B.C.E., making him a candidate to be the founder of the earliest religion based on a revealed scripture, the Yasna, while others place him anywhere between the eighteenth and the sixth centuries B.C.E. Zoroaster taught that a the universe is pervaded by a Cosmic Battle between the uncreated creator, Ahura Mazda and the principle of darkness and evil, Angra Mainyu. Humans can aid the eventual victory of light and of order over darkness and chaos through their “Good Thoughts, Good Words, Good Deeds” (“Humata, Hukhta, Huvarshta”). Scholars have argued that Zoroastrian monotheism influenced the evolution of Jewish monotheism, which is said to have began as henotheism (devotion to one God while recognizing the existence of others) and not to have become fully monotheistic until the Babylonia captivity, partly due to contact with Zoroaster's followers. Zoroastrian belief in heaven and hell and in the resurrection of the dead and in the Day of Judgment may also have impacted on Christianity. zarəta- ("old") + uštra ("camel"), meaning "having old camels; the one who owns old camels." Avestan zaray/Modern Persian zærd ("yellow" or "golden") + uštra ("camel"), meaning "having yellow camels" or possibly "having golden camels; he who obtains wealth by trading with goods carried on camels." zara ("shine," "gold," or "light") + tushtra/tusht ("friend" or "lover"), meaning "he who loves the light." zara ("gold") + ushas ("dawn"), a wrongly presumed Avestic cognate of Vedic Sanskrit, meaning "[bringer of the] golden dawn." A variant of this is "Golden Star," which assumes the second part of his name is a variant of aster or akhtar ("star"). The latter two interpretations seem to have derived from a desire to give a more fitting meaning to the prophet's name than "owner of feeble camels." Zero-ashta from the Chaldean zero ("seed") + ashta ("woman"). This is seen by some as an attempt to establish the prophet as fulfiller of Genesis 3:15. 1400 B.C.E. to 1000 B.C.E., which represents the current scholarly consensus, is cited by Mary Boyce in her A History of Zoroastrianism (1989). "Before 458 B.C.E." is cited by H.S. Nyberg (1889-1974) in Die Religionen des Alten Iran (1938). The Bundahishn ("Creation"), an important Zoroastrian religious text, cites the time of Zoroaster as 258 years before Alexander the Great's invasion of Persia (i.e., 588 B.C.E.). This "Traditional Date of Zoroaster" was accepted by many scholars, among them S.H. Taghizadeh (1878-1970) and W.B. Henning (1908-1967). Although other scholars such as James Darmesteter (1849-1894), who placed Zoroaster around 100 B.C.E., have argued for later dates, these theories are now widely rejected. From an early time, some scholars noted problems with the "Traditional Date," i.e., linguistic difficulties that it presents. Tradition holds that Zoroaster composed the eighteen poems that make up the oldest parts of the Avesta, the Gāthās. The language of the Gāthās and the text known as Yasna Haptanghaiti (the "Seven Chapter Sermon") is called Old Avestan, and is significantly more archaic than the language of the later parts of the Avesta, Young Avestan. Gathic Avestan was still etymologically similar to the Vedic Sanskrit of the Rigveda. Sound changes separating the two branches, which both descended independently from Proto-Indo-Iranian, include the loss of z, the development of a retroflex series in Indo-Aryan, and the loss of aspiration and of prevocalic s in Iranian. Since Rigvedic Sanskrit is slightly more conservative than Gathic Avestan, the Avesta is usually dated to a few centuries after the Rigveda. Based on the date of the Rigveda’s composition, commonly stated as between the fifteenth and twelfth centuries B.C.E., and a date of Proto-Indo-Iranian of roughly 2000 B.C.E., the Gāthās are commonly dated within two hundred years of 1000 B.C.E. The historical approach compares social customs described in the Gāthās to what is known of the time and region from other historical studies. Since the Gāthās are cryptic and open to interpretation, this method also yields only rough estimates. The Gāthās seem to indicate a society of nomadic pastoralists, which contrasts sharply with the view of Zoroaster living in the court of an Achaemenid satrap such as Vishtaspa (believed to be Zoroaster's first patron). The absence in the Gāthās of any mention of Achaemenids or any West Iranian tribes such as Medes, Persians, or even Parthians, makes it unlikely that the historical Zoroaster ever lived in the court of a sixth century satrap. Although it is possible Zoroaster lived sometime between the thirteenth and eleventh centuries B.C.E., before Iranian tribes settled in the central and western areas of the Iranian Plateau, it is just as likely for him to have lived in a rural society during the centuries immediately after the Iranian migration. Therefore, although the historical estimate is consistent with the linguistic one, it is just as vague; the Italian scholar Gherardo Gnoli (1937- ) gives a date near 1000 B.C.E. Archaeological evidence is usually inconclusive regarding questions of religion. However, a Russian archaeologist, Viktor Sarianidi, links Zoroaster to circa 2000 B.C.E. based upon excavations of the Bactria-Margiana Archaeological Complex, the modern archaeological designation for a Bronze Age culture of Central Asia, dated to circa 2200–1700 B.C.E. Indo-Iranian religion is generally accepted to have begun in the late 3rd millennium B.C.E. (e.g., the Soma cult), but Zoroaster himself already looked back on a long religious tradition. The Yaz culture, an early Iron Age culture in the Afghan-Turkmen-Iranian border area (c. 1500-1100 B.C.E. ), is considered a likely staging ground for the development of East Iranian and early Zoroastrian practices. Zoroaster was famous in classical antiquity as the founder of the religion of the Magi. His name is mentioned by Xanthus (fifth century B.C.E. ), Plato (c.428-c.348 B.C.E.) in the Alcibiades, Pliny the Elder (23-79 C.E. ), Plutarch (c.46-127 C.E. ), and Diogenes Laertius (c.200-250 C.E.). Ancient Greek estimates are dependent upon Persian mythology, and give dates as early as the seventh millennium B.C.E., which are the dates to which Parsis subscribe. Persian mythology, primarily from the Shāhnāma ("The Book of Kings") of the Persian poet Ferdowsi (935-1020 C.E. ), and oral tradition place Zoroaster quite early. Manly Palmer Hall (1901-1990), in his book Twelve World Teachers, arrives at a rough estimate ranging from 10,000 to 1000 B.C.E. Information about the life of Zoroaster primarily derives from the following sources: the Avesta, the Gāthās, Greek texts, oral history, and archaeological evidence. The Spena Nask, the thirteenth section of the Avesta, which describes Zoroaster's life, has disappeared over the centuries, and the biographies in the seventh book of the Dēnkard (ninth century C.E.) and in the Shāhnāma (tenth century C.E.) are based on earlier texts. The Gāthās are poetic admonitions and prophecies cast in the form of dialogues with God and the Aməša Spəntas ("Bounteous Immortals"; Pahlavi Amahraspandān). They also contain allusions to personal events, such as Zoroaster's triumph over obstacles imposed by competing priests and the ruling class. They also indicate that he had difficulty spreading his teachings, and was even treated with ill-will in his mother's hometown, which was an exceptional insult in his culture. Important differences exist between the two texts. In the later Avesta, Zoroaster is depicted wrestling with the Daēvas ("evil immortals"; Pahlavi Dēwān), and is tempted by Ahriman to renounce his faith (Yasht, 17, 19). This account is comparable to the story of the Temptation of Christ in the Synoptic Gospels. The historical Zoroaster, however, eludes categorization as a legendary character. The Gāthās within the Avesta make claim to be the literal word of the prophet. The Vendidad also gives accounts of the dialogues between Ahura Mazdā and Zoroaster. They are the last-surviving account of his doctrinal discourses, presented at the court of King Vištāspa. From Greek accounts, it can be assumed that Zoroaster lived in the northeastern area of ancient Persian territory. The Greeks refer to him as Bactrian, because the area where Afghanistan now lies is where he preached his religion. These texts include many rote details of his life, such as a record of his family members: His father was Pourushaspa Spitāma, son of Haecadaspa Spitāma, and his mother was Dughdova. He and his wife Hvōvi had three daughters, Freni, Pourucista, and Triti; and three sons, Isat Vastar, Uruvat-Nara, and Hvare Ciθra. 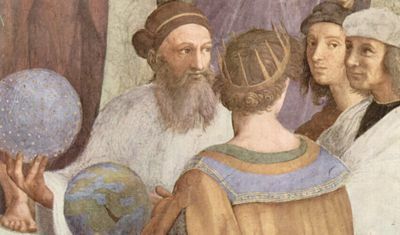 Zoroaster's great-grandfather Haēcataspa was the ancestor of the whole family Spitāma, for which reason Zoroaster usually bears the surname Spitāma. His wife and children, and a cousin named Maidhyoimangha, were his first converts after his illumination from Ahura Mazdā at age 30. Greek accounts additionally record some details regarding the childhood of Zoroaster and his hermitic lifestyle. According to tradition and Pliny the Elder's Natural History, Zoroaster laughed on the day of his birth. He lived in the wilderness and enjoyed exploring it from a young age. Plutarch compares him with Lycurgus and Numa Pompilius, the second king of Rome according to legend. Dio Chrysostom (c.40-c.120 C.E.) relates Zoroaster's Ahura Mazdā to Zeus. Plutarch, drawing partly on Theopompus, speaks of Zoroastrianism in Isis and Osiris: In this work, he is a mortal, empowered by trust in his God and the protection of his allies. He faces outward opposition and unbelief, and inward doubt. Textual evidence conflicts in regard to the birthplace of Zoroaster. While Yasnas 9 & 17 cite the Ditya River in Airyanem Vaējah (Pahlavi Ērān Wēj), or "Homeland of the Aryans," as his home and the scene of his first appearance, the Būndahišn, or "Creation," (20, 32 and 24, 15) places his birth and his father’s home near the Dhraja River. This same text identifies Ērān Wēj with the district of Aran on the river Aras (Araxes), close by the north-western frontier of the Medes. According to Yasna 59, 18, the zaraθuštrotema, or supreme head of the Zoroastrian priesthood, resided in Ragha at a later time during the Sassanid dynasty. The Persian Muslim writer Shahrastani has endeavored to solve the conflict by arguing that Zoroaster’s father was from Atropatene, while his mother was from Rai. According to Yasnas 5 & 105, Zoroaster prayed for the conversion of King Vištaspa, and afterwards left his native district. Yasnas 53 & 9 suggest that he ventured to Rai, where he was unwelcome. Eventually, he met Vištaspa, king of Bactria, who appears in the Gāthās as a historical personage. The court of Vištaspa included two brothers, Frašaōštra and Jamaspa, both of whom were viziers of Vištaspa according to legend. Zoroaster was closely related to both: his wife, Hvōvi, was the daughter of Frashaōštra, while Jamaspa was the husband of his daughter Pourucista. The actual role of intermediary was played by the pious queen Hutaōsa. Apart from this connection, the new prophet relied especially upon his own kindred (hvaētuš). Placing the date of King Vištaspa is difficult. There was another individual called Hystaspes, who was he father of Darius I. Hutaōsa could be Atossa, queen consort to Cambyses II, Smerdis, and Darius I. The matriarchal name is the only link to the Achaemenidian lineage. According to the Book of Arda Viraf, Zoroaster taught an estimated 300 years before the invasion of Alexander the Great. Assyrian inscriptions relegate him to a more ancient period. Eduard Meyer maintains that the Zoroastrian religion must have been predominant among the Medes; therefore, he estimates the date of Zoroaster at 1000 B.C.E., in agreement with Duncker (Geschichte des Altertums, 44, 78). Zoroaster may have emanated from the old school of Median Magi and appeared first among the Medes as the prophet of a new faith, but met with sacerdotal opposition and turned eastward. Zoroastrianism then seems to have acquired a solid footing in eastern Iran, where it continues to survive in dwindling numbers. Zoroaster’s death is not mentioned in the Avesta; in the Shahnama, he is said to have been murdered at the altar by the Turanians in the storming of Balkh. The teachings of Zoroaster are presented in the Yasna, 17 liturgical texts or "hymns," which is divided into groups called Gāthās. The foundation of human existence is the cosmic struggle between Aša (Pahlavi Ahlāyīh), "The Truth," and Druj (Pahlavi Druz), "The Lie" (or 'anti-creation'). This may also be conceptualized as a battle between Darkness and Light, a structure parallel to the struggle between good and evil in Western paradigm. The two opposing forces in this battle are Ahura Mazdā (God) and Ahriman (The Devil). In the yasnas, Zoroaster refers to these forces as “the Better and the Bad.” For defining these two contrasting powers, Zoroastrianism is termed dualistic. Zoroaster describes Ahura Mazdā in a series of rhetorical questions: "Who established the course of the Sun and stars?… Who feeds and waters the plants?… What builder created light and darkness? … Through whom does exist dawn, noon and night?" (Yasna 44, 4-6). Zoroaster's teachings are often called dualist, explaining the universe as the result of "the outcome of two eternally opposed and coexisting principles" . However, Ahura Mazda and Angra Mainyu, or Ahriman, are not co-equal; the latter is an emanation or spirit of the former whose exercise of free will led him to embrace evil. This could be the source of the Christian conception of Satan as a fallen angel. Angra Mainyu is twin to Spenta Mainyu, the spirit of good that strengthens creation and aids humanity in their fight against evil. "Many principles of the Zarathustrian religion have left a deep imprint on the Tajik people's mind. The habit has been preserved prohibiting the killing of animals when they are pregnant and the cutting of trees in blossom. Water, earth and fire have to be protected from any impurity. The fumes of some fragrant herbs are still used to keep away sickness and the force of evil. These and many other examples give evidence that in every Tajik house we may find trace of Zarathushtra's teachings. Let us hope in the new millennium, the Tajik people will continue to live under the spiritual guidance of Zarathushtra, the prophet of truth and light." Rahmonov subsequently convinced UNESCO to declare 2002-2003 the third millennium since Zoroaster's birth. This gave rise to an extraordinary show of support by Zoroastrian organizations worldwide, resulting in hundreds of large and small commemorative events to celebrate the declared anniversary from diverse locations such as Dushanbe, Tehran, Mumbai, New York, and Vancouver. UNESCO's secretary-general later declared UNESCO’s support for this worldwide collaboration in several speeches and texts. Zoroaster was known as a sage, magician, and miracle-worker in post-Classical Western culture. Though almost nothing was known of his ideas until the late eighteenth century, by that time his name was already associated with lost ancient wisdom and had been appropriated by Freemasons and other groups who claimed access to such knowledge. Zoroaster appears as “Sarastro” in Mozart's opera Die Zauberflöte, which has been noted for its Masonic elements, where he represents moral order in opposition to the "Queen of the Night." Enlightenment writers such as Voltaire promoted research into Zoroastrianism in the belief that it was a form of rational Deism, preferable to Christianity. With the translation of the Avesta by Abraham Anquetil-Duperron, Western scholarship of Zoroastrianism began. The 2005 edition of the Oxford Dictionary of Philosophy places Zoroaster as first in the chronology of philosophers because he was the founder of Mazda-Yasna, which can be translated to "worship of wisdom." Zoroastrians later educated the Greeks, who used a similar term, philosophy, or “love of wisdom,” to describe the search for ultimate truth. In addition, Zoroaster is ranked #93 on Michael H. Hart’s list of the most influential figures in history. German philosopher Friedrich Nietzsche used the name Zarathustra in his seminal work Also sprach Zarathustra (Thus Spoke Zarathustra)]] (1885), in which he fictionalized the historical figure to meet his own literary and philosophical aims. Nietzsche presents Zoroaster as a returning visionary who repudiates the designation of good and evil and thus marks the observation of the death of God. Nietzsche asserted that he chose Zoroaster as a vehicle for his ideas because the historical prophet had been the first to proclaim the manicheic opposition between "good" and "evil" by rejecting the Daēva, who represent natural forces, in favor of a moral order represented by the Ahuras. Richard Strauss's Opus 30, inspired by Nietzsche's book, is also called Also sprach Zarathustra. Its opening theme, which corresponds to the book's prologue, was used to score the opening sequence of Stanley Kubrick's movie 2001: A Space Odyssey. Bahá'ís believe Zoroaster was a "Manifestation of God," one of a line of prophets who have progressively revealed the Word of God to a gradually maturing humanity. Zoroaster therefore shares an exalted station with Abraham, Moses, Buddha, Krishna, Jesus, Muhammad, the Báb, and the founder of the Bahá'í Faith, Bahá'u'lláh. However, the Central Figures of the Bahá'í Faith caution believers that, as with many Manifestations, few if any teachings of Zoroaster that have survived to the modern age can be authenticated, and any contradictions between the teachings of the Manifestations are ascribed to later corruptions or the differing needs of the age and culture. Shoghi Effendi, the Guardian of the Faith, wrote that Bahá'u'lláh fulfilled the Zoroastrian prophecy of the return of the Sháh-Bahrám: "To Him [Bahá'u'lláh] Zoroaster must have alluded when, according to tradition, He foretold that a period of three thousand years of conflict and contention must needs precede the advent of the World-Savior Sháh-Bahrám, Who would triumph over Ahriman and usher in an era of blessedness and peace." `Abdu'l-Bahá, one of the Bahá'í Faith's Central Figures, has stated that Zoroaster lived roughly 1,000 years before Jesus. ↑ Rüdiger Schmitt, "Zoroaster's Name," in The Circle of Ancient Iranian Studies. CAIS, Zoroaster's name Retrieved August 28, 2007. ↑ Noorbakhsh Rahimzadeh, "The First Monotheist Prophet," Vahooman; Cultural, Social Magazine 14 (May 23, 1998): 32-39. Online. Retrieved August 28, 2007. Gnoli, Gherardo. "Agathias and the Date of Zoroaster," Eran ud Aneran, Festrschrift Marshak. 2003 Agathias and the date of Zoroaster www.transoxiana.com. Retrieved August 28, 2007. Nietzsche, Friedrich. Thus Spoke Zarathustra, (prologue) translated by Thomas Common. Thus Spake Zarathustra (Prologue) Retrieved August 28, 2007. Nyberg, H.S. Die Religionen des Alten Iran. Leipzig, Germany: J.C. Hinrichs verlag, 1938. Schmitt, Rüdiger. "Zoroaster, the name," Encyclopaedia Iranica (Zoroaster: The Name Retrieved August 28, 2007. Shahbazi, Shapur and Ali Reza. “The Traditional Date of Zoroaster Explained,” BSOAS 40 (1). London. Willey, Mark. "Influence of Zoroastrianism on Judaism and Christianity" in Iranian Religions: Zoroastrianism. The Circle of Ancient Iranian Scholars (Influence of Zoroastrianism on Judaism and Christianity Retrieved August 28, 2007. Harry Thurston Peck's entry on Zoroaster, in the Harpers Dictionary of Classical Antiquities (1898) Perseus Tufts University. Zarathushtra's Gathas Sacred Liturgy and Gathas/Hymns of Zarathushtra avesta.org. Zoroastrians Keep the Faith, and Keep Dwindling New York Times. This page was last modified on 2 July 2013, at 15:18.